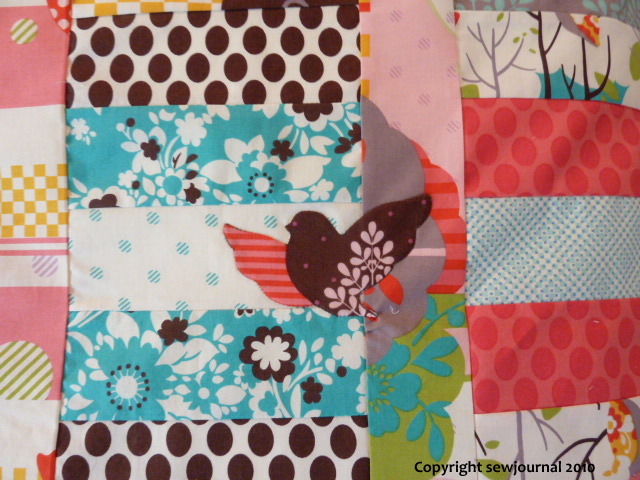 Do you remember the “It’s a Hoot Baby Quilt”? 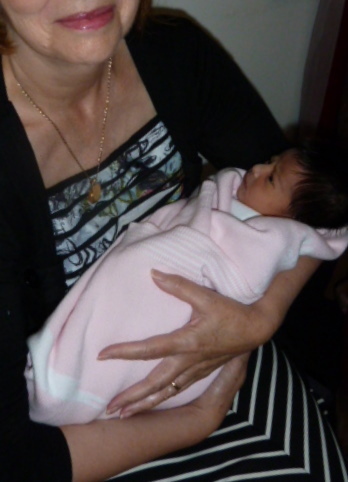 Well its intended recipient made her entrance into this realm on the 10th January. Her name is Amara and here she is being cuddled by me. 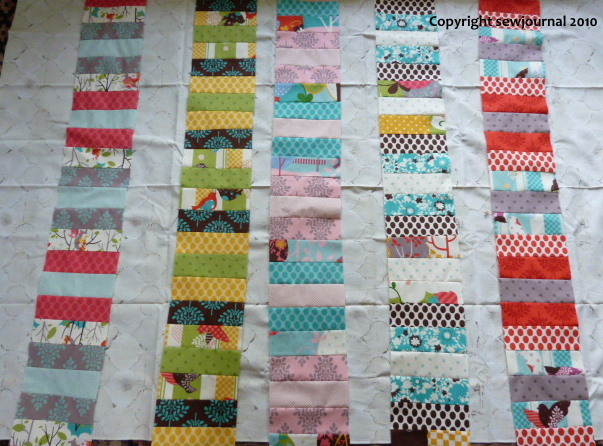 Yesterday I managed to complete the quilting of the It’s a Hoot baby floor quilt. 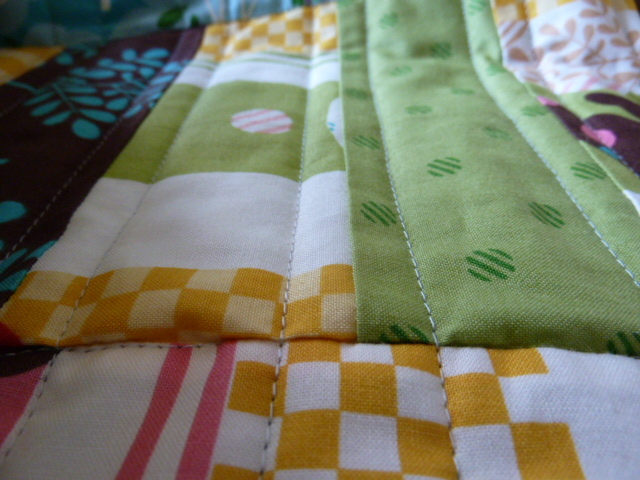 I machined in the ditch vertically then I stitched 1/4″ either side of the horizontal seams. I was quite impressed with the Pinmoors as a basting method. I hand quilted the shadow of the appliquéd bird – first in brown then a dusty pink and the a pale turquoise and I’m quite please with the effect. 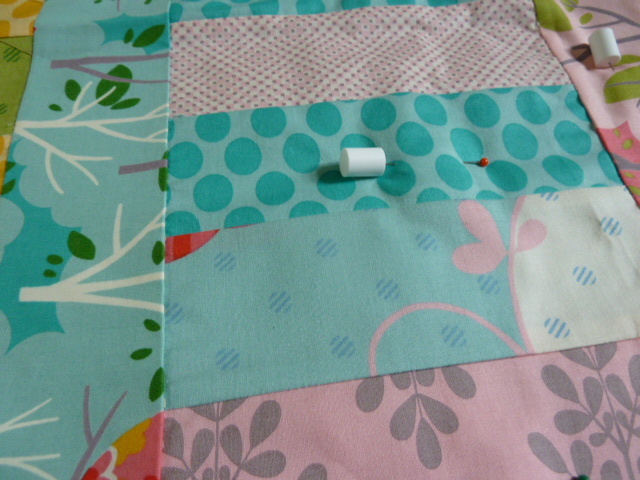 Now I just have to do the binding and I’m finished. What do you think of the backing? 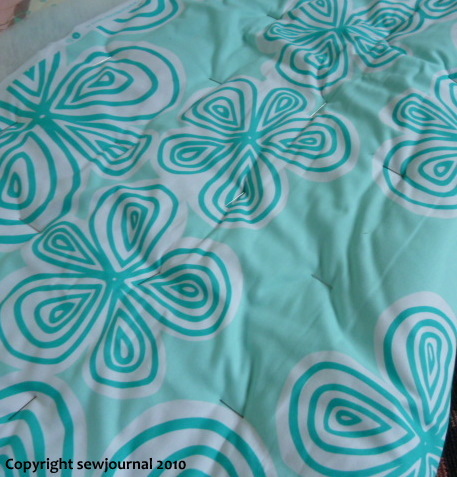 It’s a bit creased as I had to pack it away to bring it home but I’ll press it again before I start quilting. Well I finally got the It’s a Hoot quilt top finished. 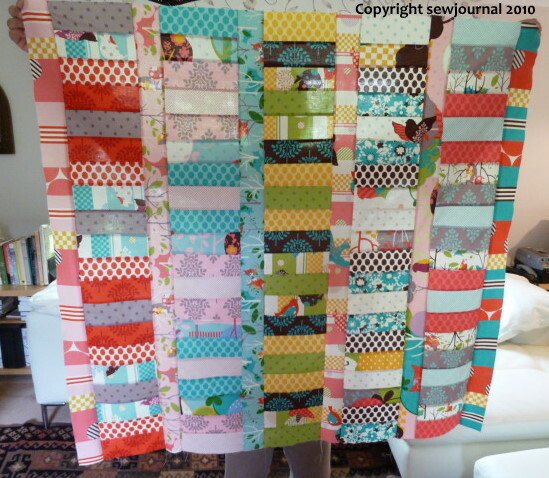 I used strips from the jellyroll for the sashing. What do you think? 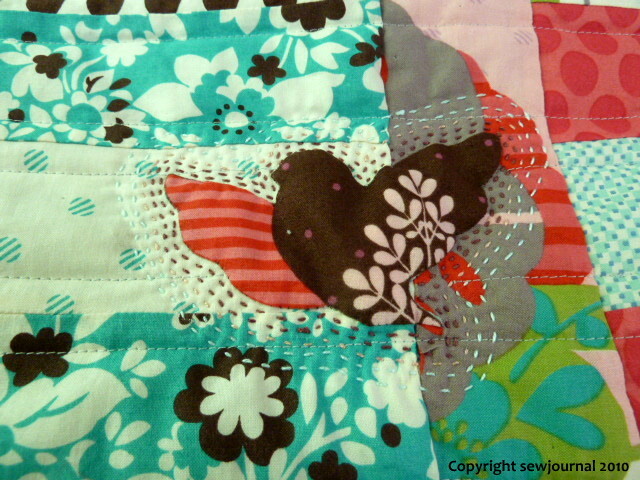 Because I had to take four pieces off the bottom of each panel I had a spare piece that had a whole bird on it. 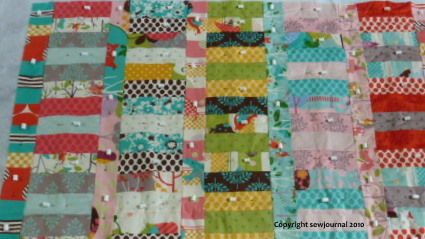 I appliquéd the bird across two strips and I think it looks like it’s flying out of that tree. Here’s a close up. Now to choose a backing. It’s hard because I’m trying to only use my stash and as I’ve only been collecting for 2 years I don’t have a huge one to fossick through. I’ll get back to you on the backing. Corrie of the retromummy blog is offering readers a chance to win 14 fat quarters of the lucsious Sweet Broderie fabrics range. She’s going to pick three winners so visit her post here and leave a comment and you’ll be in the draw. Good luck! What a difference a day makes! Sunday was hot and humid and yesterday was was as wet as wet can be. I took this photo from my office window. Just look how green everything is. 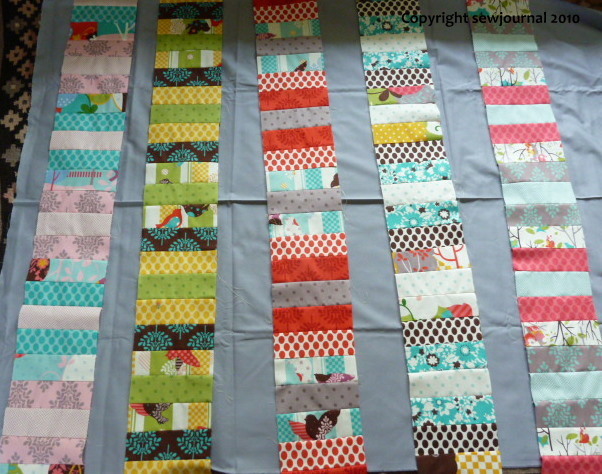 Well I was hoping to show you a finished It’s a Hoot quilt top but between physio and podiatrist appointments and sore ankles I didn’t really get much machine sewing done. However I do want to thank you all for your input on the background colour. I think that of the ones I showed you the small dots on the beigey grey background was the best. However even it didn’t really grab me. 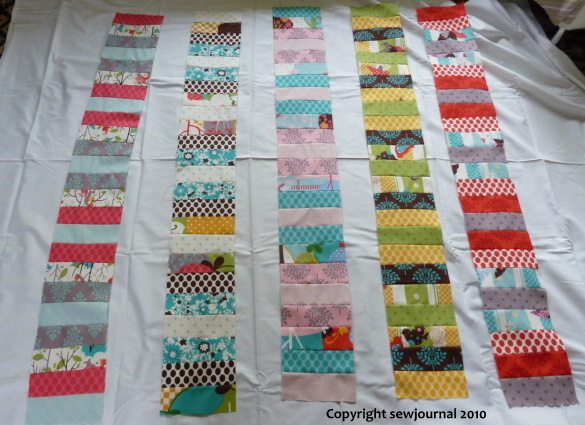 Then I decided to look at the remaining jellyroll strips and I’ve used those. 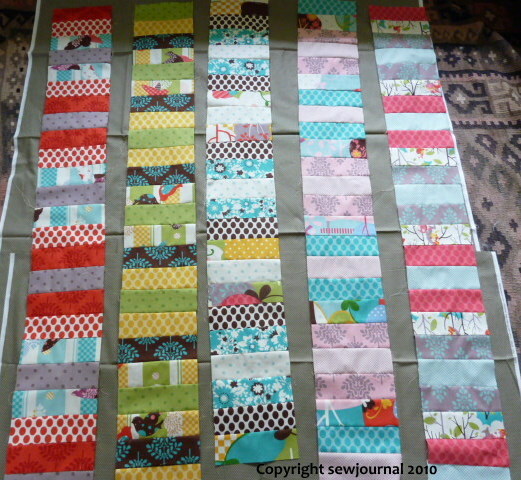 I had to shorten my strip panels by 4 pieces so that a whole jellyroll strip would reach to the end but I’m liking what I’m seeing as I sew (and unsew – can you believe I actually sewed one strip wrong side up! I guess that’s what’s being less than 100% does for you lol). Anyway, hopefully by tomorrow the top will be finished and I can show what it looks like.